I provide respectful guidance to businesses for exploiting, commercializing, and monetizing there key intangible assets to…sources of revenue, value, competitive advantage, and reputation, etc. circumstance, context, risk, and particular objectives set forth by a business and/or client. issues and/or challenges related to (past-present-future) control, use, ownership of the assets. how – when (circumstance, transaction, etc.) the assets’ conversion is intended to be applied for a return. strategically re-assessing precisely how the contributory role and value of the intangible assets can best be utilized – applied. 80+% of most company’s value, sources of revenue, competitiveness, and sustainability lie in – emerge directly from intangible assets, i.e., various forms of intellectual, structural, and relationship capital. Doing so will seldom, if ever…influence new business challenges and/or risks to surface and cause either party provoke a party to assume a proposed or pending transaction will be at risk! For these reasons, especially in today’s go fast, go hard, go global workforce and business (transaction) environment…unraveling and endeavoring to lucratively and competitively resolve IA-related challenges, risks, or disputes surely warrants having at will expertise and capabilities to engage a company’s intangible assets rapidly, knowledgeably, and effectively, ala intangible asset operational familiarity. I am not suggesting here that…even a large percentage of business initiatives – transactions will be challenged or at risk today based upon misunderstandings, misgivings, or alternate interpretations about the disposition, use, contributory role, value, ownership, or control of key intangible assets in play. However, many materialized business risks today are capable of delivering, if ignored or unrecognized, levels of vulnerability, probability, and criticality which can cascade throughout an enterprise. It is imprudent for business leadership to…exhibit dismissiveness and/or disregard for their key intangible assets. It is prudent, however, for leadership to…anticipate and be prepared to rapidly and effectively monitor and respond to challenges – risks to emerge. 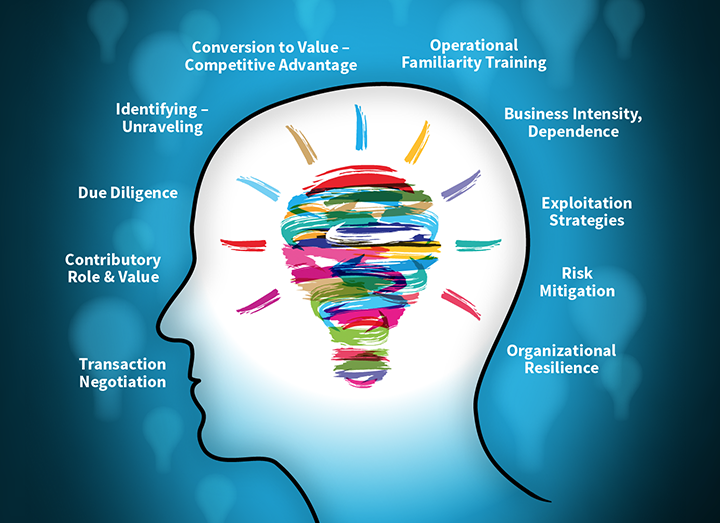 Obviously, the primary objective for business leadership is to convert their intangible assets…in ways that mitigate, if not prevent, risks from materializing that adversely affect intangible asset value, create cascading effects, and/or influence a transaction outcome to be impeded, or less competitive. That said, as a practitioner, I recognize the…stewardship, oversight, and management, ala conversion, of any businesses intangible assets as being largely executed – realized as operational norms for the forward looking – thinking. deliberate, lucrative, competitive, and executable strategies – decisions can emerge rapidly, and perhaps, most importantly, at will. There is no doubt today, that...growing percentages of business relationships and transactions emerge, develop, and execute on-the-basis-of ultra-valuable and ultra-competitive intangible assets being available and in play. As such, the stakes and outcomes to business transactions and initiatives are indeed, high. competitive strategies (paths) to convert the growing numbers of intangible asset intensive – dependent businesses to lucrative, competitive, and sustainable entities. Categories: Fiduciary Responsibility, IA Value Propositions, Intangible Asset Value, Intangible assets contributory value. Tags: Converting intangible assets., Intangible asset conversion.